Justice Ruth Bader Ginsburg, rebranded late in her career as the Notorious RBG, has recently been getting all the love due to a pioneering woman Supreme Court justice. 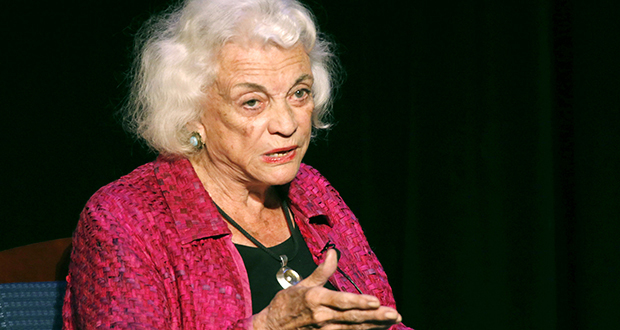 But her colleague Justice Sandra Day O’Connor, who announced Tuesday that she is stepping out of public life at age 88 because of creeping dementia, is just as important in the history of the Constitution. Indeed, measured in terms of impact on the court, O’Connor had a much greater historical effect than Ginsburg, much of whose importance so far comes from her pioneering women’s rights work as a litigator. It’s worth expanding the spotlight in this moment and celebrating O’Connor’s extraordinary career now, while she is able to appreciate our appreciation. No doubt learning to ride and shoot left O’Connor strong and independent-minded. But she was also whip smart, by her own account finishing third in her class at Stanford Law School, just behind future Justice William H. Rehnquist. Probably the most significant part of O’Connor’s early career was her service in the Arizona Senate, where she rather quickly was elected Republican majority leader. O’Connor turned out to be a skilled negotiator, with extraordinary antennae for detecting the middle position on which compromise could be reached. This would turn out to be a harbinger of her unique judicial approach. It could be plausibly argued that no one who was not a chief justice influenced the Supreme Court more than O’Connor did, with the possible exceptions of Justices Joseph Story and William Brennan. For nearly a quarter century, she was the definitive swing vote on a court that decided almost all major issues by a 5-4 vote. Much of her career overlapped with what was technically the Rehnquist court, because he was chief justice. But in historical terms, it was really the O’Connor court. Her influence was a compromising, moderate centrism. On issue after issue, O’Connor crafted decisions that fell between the bold rights-expansion of the Warren court liberals and the aggressive, activist rolling-back favored by the swashbuckling conservatives led by Justice Antonin Scalia. The centerpiece of O’Connor’s centrism was Casey v. Planned Parenthood, which declined to overrule the Roe v. Wade abortion-rights decision. Court watchers, myself included, tend to emphasize the contributions of Justice David Souter, whose philosophy was reflected in the part of the opinion featuring respect for precedent, and Justice Anthony Kennedy, who contributed the philosophical defense of a woman’s autonomy. But the whole idea of crafting a jointly signed opinion would have been inconceivable without O’Connor. The opinion, not officially authored by any one of the three justices, was an innovation and a deviation from ordinary Supreme Court practice. It reflected not only consensus centrism, but also a major step away from the cult of the individual justice. It’s tempting to say that it’s no coincidence that it was a female justice — the only one on the court at the time — who got her male colleagues to collaborate on this joint product. That is not to say that O’Connor wasn’t happy to go it alone. She was. Frequently, her opinions would determine the future course of the law — even though no one joined them. With four conservative votes and four liberal votes, she was able to determine not only who won the case but also what the precedent would be. In some areas, such as the establishment clause, she invented a whole new way of looking at the meaning of the constitutional provision. Ultimately the majority adopted it. Today, with the Supreme Court poised to enter an era with no obvious centrist swing voter, is the right moment to recognize how much we have all come to expect the court to have a wise, reasonable justice in the middle to craft pragmatic decisions that will work in practice. Our expectation is due entirely to O’Connor’s model, which Kennedy emulated after her retirement. It’s no surprise that O’Connor devoted herself to civics education after her retirement from the court. She always believed that citizenship demanded compromise and mutual respect. Those are in short supply. We are going to have to learn to appreciate O’Connor’s contributions through the lens of our current polarization.